With their most powerful hold yet, great texturisation & re-workable formula- discover L'Oréal Professionnel Homme Poker Paste for a matte finish and long-lasting look with extreme hold. Boasting a concentrated formula that is best used on dry hair, the L'Oreal Professional Homme Poker Paste (75ml) is a strong grip gel that works to give hair extreme texture and extra volume. 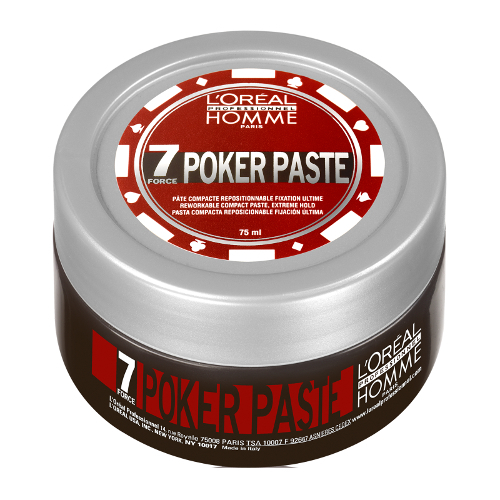 Take approximately 10 pence worth of L'Oréal Professionnel Homme Poker Paste (a little goes a long way) and rub between your hands. Then distribute evenly through damp or dry hair using your fingers to mould and sculpt into the desired hair style.